We all rejoiced when my grandfather finally got internet access. A lifelong sports fan, he daily read the newspapers. For years we’d been telling him, “If you had the internet you could read even more news.” Eventually he got dial-up, but long after high-speed internet had become available. He sat in his chair, calmly waiting for each new story to load. He was amazed by his newfound access. I was bored to tears. How can he stand this? Later that day I told my dad we should help him get faster internet. I’ll never forget my dad’s response: “He doesn’t know any different. He’s spent his whole life without internet.” That’s why it didn’t bother him. He didn’t even know it could come faster, so the wait was just part of the process of getting what he wanted. He was content to wait. I’ve thought about this experience a lot in recent years, as waiting for anything has grown even more frustrating in our hyperconnected world. I now have a smartphone and an Amazon Prime account. I order my groceries online. I wait for little, so I get vexed if I have to wait for anything. All of this made Jason Farman’s book, Delayed Response: The Art of Waiting from the Ancient to the Instant World, incredibly intriguing to me. Yale University Press (2018). 232 pp. $28.00. We have always been conscious of the wait for life-changing messages, whether it be the time it takes to receive a text message from your love, for a soldier’s family to learn news from the front, or for a space probe to deliver data from the far reaches of the solar system. 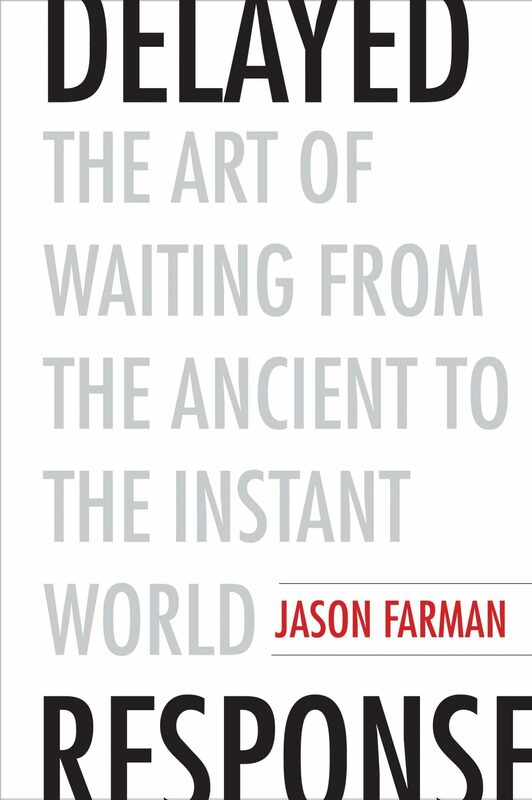 In this book in praise of wait times, award-winning author Jason Farman passionately argues that the delay between call and answer has always been an important part of the message. In a rebuttal to the demand for instant communication, Farman makes a powerful case for why good things can come to those who wait. Farman, associate professor of American studies at the University of Maryland, chronicles a variety of cultures, time periods, and processes of waiting to show that message sending and waiting isn’t new. From the aboriginal message sticks that date back to pre-colonized Australia to the modern crisis of waiting on word from loved ones after the Japan earthquake and tsunami in 2011, waiting is as old as time. Waiting is part of time. I wait for little, so I get vexed if I have to wait for anything. In short, to wait is to be human, and to be human is to live in community through your waiting. Farman connects our waiting to loving others by urging us to ask, “Who benefits from my waiting?” (189). Often when we wait, we see it as hindrance to our time (which it is). But we’re connected to a host of others, from immediate family to co-workers to church members to even the person in front of us driving too slow. This question is worth asking when we’re annoyed by waiting: How does it affect society and my sphere of influence if I lean into the wait here? This isn’t a Christian book, but Christians can learn from it. In December, many of us celebrated Advent and the birth of Christ. And what is Advent all about? Waiting. God’s people have always been a waiting people. They waited for the Messiah to be born, and we wait for him to return and restore all things to himself. But living in such a waiting-averse society only makes that harder for us. If we’re not careful and conscious, we’ll rage against waiting like everyone else in our society. God’s people have always been a waiting people. We have plenty of things to keep us distracted in our waiting, but waiting—and feeling the weight of the wait—is a good thing for all of us. To miss the goodness of waiting is to miss what waiting does in us—shape us, grow us, and sanctify us. To miss the goodness of waiting is to miss the anticipation Farman talks about, and to instead settle for waiting as annoyance (68). Of course, waiting isn’t fun. Sometimes it’s downright painful. But sometimes the most painful things are the best things for us. In the wait, we’re reminded that this isn’t our home (1 Pet. 2:11; Heb. 13:14). In the wait, we’re reminded that things still aren’t right (Rev. 21:5). In the wait, we’re left to feel the ache and longing for a better world where Jesus reigns and sin is gone. To avoid waiting is to avoid what waiting is driving us toward. Waiting is purposeful. To miss the goodness of waiting is to miss what waiting does in us—shape us, grow us, and sanctify us. When we stop seeing people as an impediment to our productivity, we see them more as humans with stories and reasons for their own delay. This is utterly Christian, even if Ferman doesn’t recognize it as such. The wait is never just about us, and for Christians we know that to be true on an even deeper level. We’re waiting for Christ to return. We’re waiting for the restoration of all things. We’re waiting in community, collectively longing for our wait to be over. Until then, let’s love others and wait well.